Imaginatively designed, on face and underbelly alike, Ski Star was produced by the Dugan Glass Company for only a few months, in 1910 and 1911. But within that narrow time frame, it was made in immense quantities and in a host of captivating shapes. The Ski Star primary pattern is comprised of two stippled eight-point stars, each formed from interlocking waning crescents. A massive star subsumes most of the expanse; a diminutive one, the dead-center. The underside of all but a tiny fraction (perhaps one-tenth of one percent) of Ski Star pieces is the Compass secondary. A striking geometric, it is an intaglio pattern that looks like it was sculpted and polished from marble. The color field is limited, characteristic, as would be expected, of the early carnival years at Indiana, Pa.: peach opal, amethyst, oxblood, and marigold. Peach opal is far and away the most prevalent. Amethyst is harder to find, oxblood even more difficult. Marigold is available, in infinitesimal amounts. Blue is said to exist. But that’s unlikely, as Dugan’s cobalt carnival was not put on retail store shelves until late summer 1912. What has been reported as cobalt Ski Star is probably amethyst or oxblood with electric blue iridescence. Surface color and iridescence can be breathtakingly beautiful, good enough, or downright dreadful. On peach opal, surface color ranges from burnt orange to autumn pumpkin to sunny mandarin to ripe cantaloupe to pale, often “washed out” peach. Iridescence runs the gamut from multicolor (aquamarine, canary, harlequin, lavender, maya, rose, and/or tangerine) to flat, with no more than orange (or, worse, peach) overlay on the clear glass base. Iridescence on the amethyst and oxblood can be stunning, the electric and multicolor exceptionally vibrant. It can also be less colorful but is rarely repugnant, the anomalous god-awful gun metal notwithstanding. Surface color and iridescence of the marigold will be discussed later on. The background surface is usually satiny, but can also be glossy or stretchy. The stretchy are especially eye-catching when fulgently iridized. Too little attention has been paid to differences in availability of collar-based and dome-footed Ski Star. Knowing the differences is a key to understanding what’s easy to get hold of and what’s tough to come by. Collar-based Ski Star-Compass comes from two mold sizes and in an extensive assortment of shapes and edge treatments (Table 1). The large pieces have a base diameter of four inches; the small, a three-inch base. All listed shapes and edgings can be found in peach opal. The same cannot be said for the amethyst and oxblood. 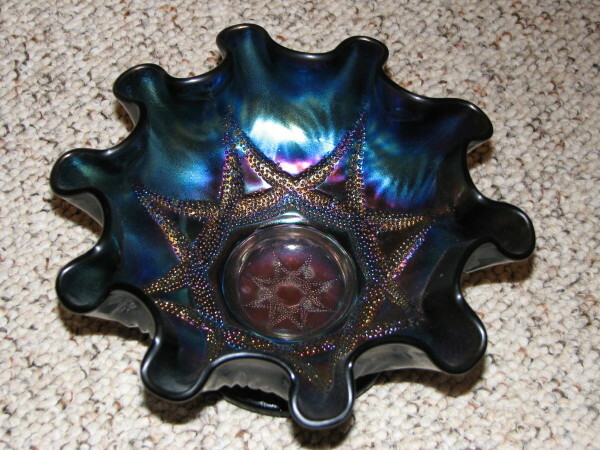 If you find a Ski Star bowl this pretty, it would be a great addition to your collection. Bowls are the most available of the shapes. The most frequently seen large bowl is the broadly-ruffled in peach opal. Its amethyst and oxblood counterparts, though seen less often, are not difficult to track down. Six- or eight-ruffled, these bowls have top diameters that range from ten to eleven inches. Large banana-shaped and three-and-one are also known in the same colors, but are hard to find. The only small bowls that turn up regularly are the peach opal, amethyst, and oxblood broadly-ruffled. Some of these have six ruffles; others, eight. Small bowls in other shapes and edgings – non-ruffled tightly-crimped, tri-cornered with smooth or crimped edges – are seldom seen. Berry sets, composed of a broadly ruffled master and six similarly-shaped serving-size bowls, sometimes surface in peach opal. These usually bring modest sums when sold because the pieces are rarely well-matched in surface color, iridescence, or, even more sadly, both. This nut bowl with an unusual edge is courtesy of Neal Becker. 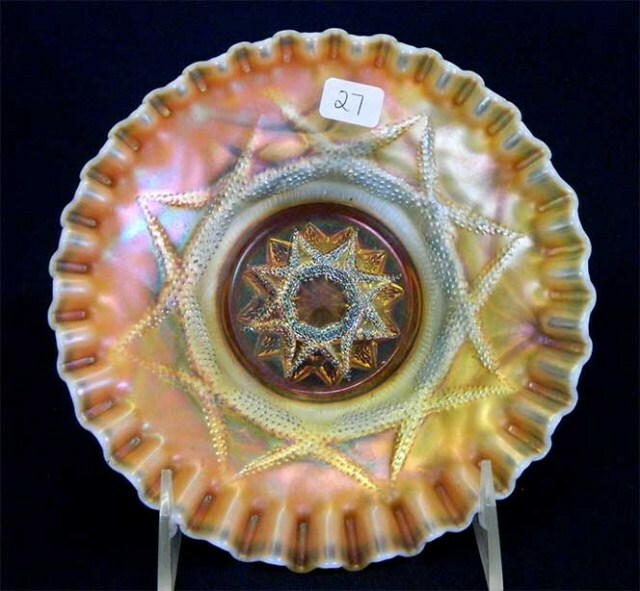 The small peach opal plate, with a tightly-crimped edge, is a collector favorite. Said also to exist in amethyst-oxblood and marigold, plates in these colors have yet to be verified beyond a shadow of a doubt. This is called a plate even though it has a tightly crimped edge. This dome footed Ski Star bowl is courtesy of Seeck Auctions. Dome-footed Ski Star-Compass comes from a single mold size but in a myriad of shapes and edgings (Table 2). Sizable proportions are tightly-crimped, though there are exceptions aplenty. They measure from about seven-and-one-half to nearly nine inches across the top, diameter dependent on how the outer edge was configured. The most frequently seen peach opal bowls are the tightly-crimped banana shape and the tri-cornered with smooth (non-crimped) edge. Their counterparts – the banana shape with smooth edge and the tightly-crimped tri-cornered – are found only occasionally. Three other shapes are also available in peach opal but hardly ever surface: a broadly-ruffled with smooth (non-crimped) edge, a flared round with tightly-crimped edge, and a three-and-one. Amethyst and oxblood dome-footed bowls are in extremely short supply and undervalued commodities. The flat-ruffled bowl employs an edge treatment unique to Dugan. It has ten essentially squared-off, rather than rounded, ruffles. Two styles, rare in peach opal as well as amethyst and oxblood, are known: a flared bowl and a nut bowl. Ruffles on the nut bowl stand almost perpendicular to the bottom of the base. A rose bowl, with turned-in top, is said to be out there somewhere. I have not been able to verify it, so have doubts as to its existence. Could this be a nut bowl rather than a rose bowl? Hey, who can help me here? Handgrips with smooth edge, some flatter (or, conversely, deeper) than others, are among the most available dome-footed shapes. It’s relatively easy to find them in peach opal. The amethyst and oxblood are seen much less often but findable without undue effort. Handgrips with a tightly-crimped edge are known in peach, but scarce. Now and then the optic surface of a smooth-edged peach opal handgrip is decorated with painted flowers and leaves. One of the most desirable shapes in Ski Star is this handled basket. 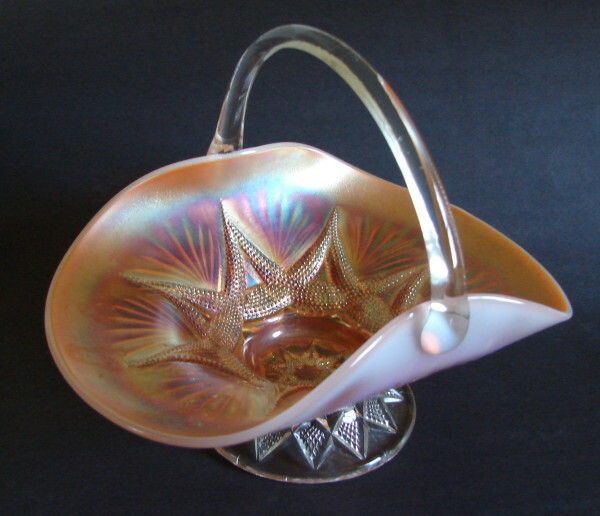 Two styles of peach opal dome-footed baskets have been confirmed. The more desirable has a clear applied handle. It is in essence a non-crimped banana-shaped bowl with a handle that was permanently attached during production. The other basket is a tightly-crimped banana-shaped bowl to which a metal handle is clamped. Both baskets are difficult to find. Marigold is an extremely rare color in Ski Star. I know of only one example, though there are surely others. If Marion Hartung had sketched her line drawing from this marigold bowl, she may well have called the pattern Morning Star instead of Ski Star. Dome-footed, tri-cornered and non-crimped, it displays a panoply of pastels (apricot, Granny Smith apple green, lavender, rose, and tangerine) outside the patterned area. Most transfixing, however, are two striking features: (a) the luminous lemon—not Dugan “good gold” – iridescence that enshrouds the dominant star and (b) the juxtaposition of contrasting surface effects – satin where multicolored, radium where brightly shines the morning star. Fred Stone, from Kansas, bought the bowl from Iowan Steve Morrow at a HOACGA convention some years back. When Fred, Ann McMorris, and Brian Pittman decided to downsize their collection a few months ago, they put it up for sale. It’s now back in the Hawkeye state, where it belongs. 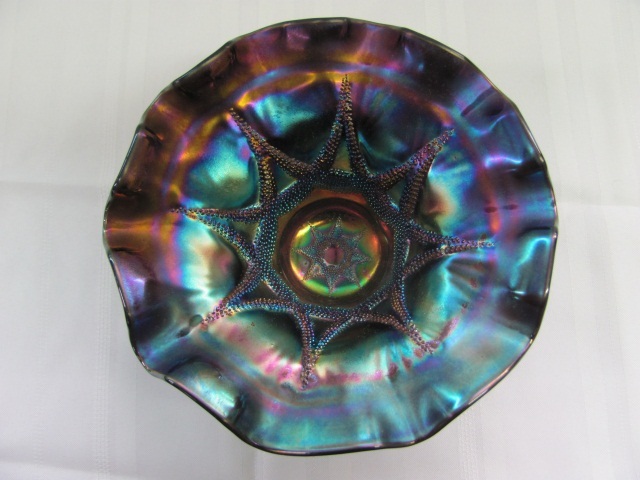 Once in a blue moon, a peach opal Ski Star bowl with Jeweled Heart, rather than Compass, on its back will surface. But there aren’t many of these in circulation. My hunch (only a hunch because I have no evidence to support the hypothesis) is that Ski Star-Jeweled Heart slightly predated Ski Star-Compass. My reasoning runs like this: As soon as Ski Star was designed and a mold cast, it was paired with Jeweled Heart,2 a holdover from pre-carnival Dugan lines, in order to expedite production. Combination found wanting at some level of company management, the Jeweled Heart was almost immediately replaced by the new, more complementary Compass. This could explain the paucity of the Jeweled Heart and the plentitude of the Compass—in peach opal, that is. Ski Star-Jeweled Heart has been reported only in collar-based bowls (Table 3). Most have six ruffles but eight-ruffled can also be found. I have written before on Ski Star, in the September 2007 issue of The Pump. Since then, I have learned more, from observing what has sold at major auctions and online and from consulting with others. So I decided that now was the time for a full-scale update. Another reason for the re-write was the opportunity to frame the content in a fresh and streamlined way. Tracking what has been put on the block, over a period of years, is essential in getting a handle on what is available and in what quantities. Auctioneers’ catalogs are invaluable sources. For these, I am grateful to Tom Burns, Mickey Reichel, Deb and the late Kris Remmen, Jim and Jan Seeck, and Jim and Laurie Wroda. 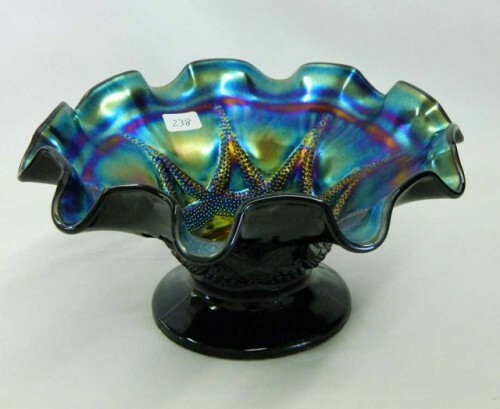 Information and images at the two principal websites devoted to carnival glass—put up and periodically expanded upon by Dave Doty and by Diane and Dean Fry, with the technical expertise of Donna Adler—are also indispensable resources as are the yearly price reports complied by Tom and Sharon Mordini. Online sellers, especially those who list on eBay, also provide useful information. Other ways in which I have deepened my under-standing are follow-ups from readers on what I have written and experts’ responses to my queries. In the case of Ski Star, these have come from Neal Becker, Greg Dilian, Diane Fry, Rick and Debbie Graham, Bob Grissom, Jerry Kudlac, Lloyd R. Ward, and Larry Yung Sr. The “good books” upon which we have long depended, while still relevant, are dated. Much has been learned about patterns, including Ski Star, since the tomes were published in the ‘90s and earlier. So we have been forced—and should feel obligated—to look elsewhere to keep abreast of an ever-evolving knowledge base. I am eager to learn more. If you have something to share, please let me know: Larry Keig, 1614 Merner Ave., Cedar Falls, IA 50613; 319.266.5044; Larry.Keig@cfu.net. 2Jeweled Heart is also the reverse pattern of the following large bowls: collar-based Cherries, Farmyard, Petal and Fan, and Smooth Rays. All were being made by Dugan, circa 1910-1911, when Ski Star was produced.